For my birthday this year I was lucky enough to get a huge miss patisserie haul as one of my presents. I was just gob smacked with all the beautiful products and it's been hard to try and keep them for special bath night's as I don't want to use them all at once. But the other night I used my unicorn hoof bath bomb/ball and oh ehm gee.... I loved it! It's no secret that I'm addicted to anything unicorn or mermaid related so when I saw I got the unicorn hoof I almost squealed... actually, I think I did haha. From first seeing it on the miss patisserie website to holding it in my hand I just grew more and more obsessed. 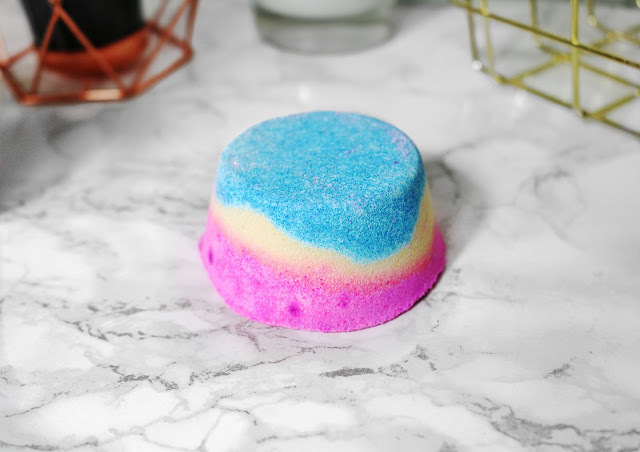 The colours in this bath ball are just beautiful, the pink, blue and yellow really mix well together and give you all kinds of colourful feels. My first impressions were wow, it looks even prettier in person than it does on the website plus it's a little bigger than I thought it was going to be. This is definitely one for the unicorn lovers out there, it's a must have. The scent is just heavenly but once it's in the water it smells 10x better. "No Unicorns were injured in making these we promise! 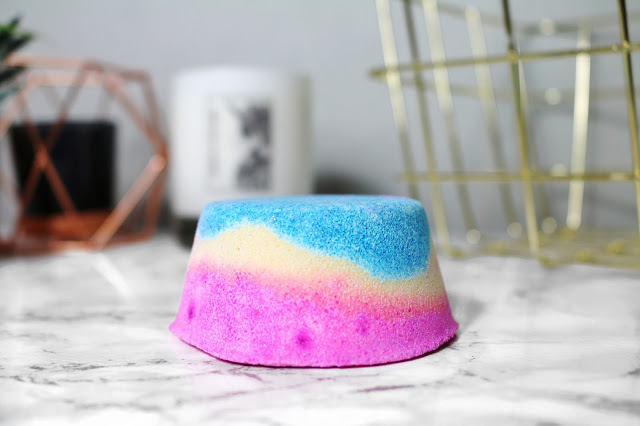 This foaming Bath Ball has a rainbow of colours that will turn your bath into a kaleidoscope of foam. The scent is sweet blossom and peach." So let's get onto how it preformed shall we? Once I put this in the bath it slowly started to melt away, I am very impressed with the "fizzing" time as it took forever to melt away (which is good! I hate one trick wonders) watching the unicorn hoof just drift around the water slowly was very calming, I even forgot the water was running and almost flooded the place haha but the colours it was producing was beautiful, I just need more of this in my life. Once it had fully melted away the water was left a beautiful muted pink colour with glitter spread throughout..... THERE'S GLITTER OMG THIS IS PERFECT FOR ME. If there's something I love just as much as bath products it's glitter so when you combined the two that makes for a very happy Jordanne. The glitter isn't over powering, it's subtle but noticeable. The scent of this bath bomb is said to be sweet blossom and peach which I can definitely get. The peach is the most predominant scent throughout which left my bathroom and me smelling like a peach godess! I honestly can't get over how strong the scent was, I was extremely impressed with it. All in All this bath ball is one if my favourites from miss patisserie. The colours are stunning, it smells fantastic and performs amazingly. I would definitely recommend to all you bath addicts out there. Sounds so glittery and perfect! I need one! I'm with you on the unicorn / mermaid obsession, I have exactly the same haha! I've never purchased from this company before but I'm obviously missing out because the colour / glitter and scents sound amazinggg! Thanks for sharing your thoughts! Woow I love the sound of this one! I've never heard of Miss Patisserie though, I might have to check them out! Especially if they sell gorgeous bath bombs!